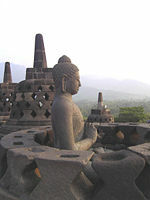 Borobudur, a ninth century Buddhist Mahayana monument in Central Java, Indonesia. Built for the devotees of Mahayana Buddhism, the temple stands as one of the most impressive examples of Buddhist sacred architecture in the world. UNESCO designated Borobudur a World Heritage site in 1991 as "Borobudur Temple Compounds" in recognition of its unique and magnificent craftsmanship. UNESCO included Mendut Temple and Pawon Temple in the designation. Borobudur stands in three sections, each constructed to lead the devotee symbolically to the highest level, Enlightenment. The first level represents the world of desire (Kamadhatu), the second level the world of forms (Rupadhatu), and the third level the world of the formless (Arupadhatu). Artists have carved nearly 1500 relief panels on the walls and balustrades to inspire the devotee on the circumambulation through the three levels. When viewed from above, the temple takes the shape of a tantric Buddhist mandala. In an astounding feat of construction, workman hauled the nearly 2 million cubic feet of stone from nearby rivers. In Indonesian, candi, or formerly chandi means temple. The term also more loosely describes any ancient structure, for example, gates and bathing structures. The origins of the name Borobudur remains unclear, as the original name of most candi has been lost. The Sir Thomas Raffles book on Java history first mentions the name "Borobudur." Raffles wrote about the existence of a monument called borobudur, but no other older documents suggest the same name. Nagarakertagama, written by Mpu Prapanca in 1365 C.E., represents the only written old Javanese manuscript hinting at the monument. It mentions Budur as a Buddhist sanctuary, which likely associates with Borobudur, but the manuscript lacks any further information to make a definite identification. Borobudur location on Indonesia map. A number of Buddhist and Hindu temple compounds cluster approximately 40 km (25 miles) northwest of Yogyakarta, on an elevated area between two twin volcanoes, Sundoro-Sumbing and Merbabu-Merapi, and the Progo river. According to local myth, the area known as Kedu Plain constitutes a Javanese 'sacred' place and has been dubbed "the garden of Java" due to its high agricultural fertility. 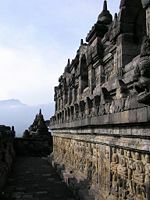 During the first restoration, the crews discovered that three Buddhist temples in the region, Borobudur, Pawon and Mendut, sit in one straight line. The temples' alignment supports a native folk tale that a long time ago, a brick-paved road stretched from Borobodur to Mendut with walls on both sides. Unlike other temples, built on a flat surface, Borobudur sits on a bedrock hill, 265 m (869 ft) above sea level and 15 m (49 ft) above the floor of the dried-out paleolake. Lotus flowers appear in almost every Buddhist work of art, often serving as a throne for buddhas and base for stupas. The architecture of Borobudur itself suggests a lotus depiction, in which Buddha postures in Borobudur symbolize the Lotus Sutra, mostly found in many Mahayana Buddhism (a school of Buddhism widely spread in southeast and east Asia regions) texts. Three circular platforms on the top have been thought to represent a lotus leaf. Buddhist pilgrims meditate on the top platform. Written records telling who built Borobudur, or of its intended purpose, have never been found. Archaeologists estimate the construction time by comparison of carved reliefs on the temple's hidden foot and the inscriptions commonly used in royal charters during the eight and ninth centuries. Borobudur probably had been founded around 800 C.E. That corresponds to the period between 760–830 C.E., the peak of the Sailendra dynasty in Central Java, under the influence of the Srivijayan Empire. The construction took 75 years, completed in 825, during the reign of Srivijayan Maharaja Samaratunga. Confusion between Hindu and Buddhist rulers in Java around that time exists. The Sailendras had been known as ardent followers of Lord Buddha, although stone inscriptions found at Sojomerto suggest they had been Hindus. During that time many Hindu and Buddhist monuments had been built on the plains and mountain around the Kedu Plain. 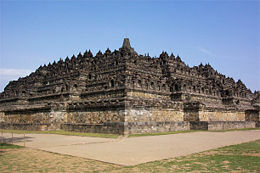 The Buddhist monuments, including Borobudur, appeared around the same time as the Hindu Shiva Prambanan temple compound. Borobudur stupas overlooking a shadowy mountain of Java. For centuries, it has been deserted. For centuries, Borobudur lay hidden under layers of volcanic ash and jungle growth. Why the monument had been deserted remains a mystery. When the monument ceased to function as the pilgrimage center of Buddhism also remains unknown. The temples may have been abandoned when the population converted to Islam in the fifteenth century. Or a famine caused by a volcanic eruption (est. c. 1006 C.E.) may have forced local inhabitants to leave their lands and the monument. The volcanic eruption may have triggered the movement of Javanese power from the Kedu Plain area to the east of Java nearby the Brantas valley as early as 928 C.E. The great monument never completely left the local people's memory. Instead of glorifying story about the monument, the memory gradually shifted into a more superstitious beliefs associated with bad luck and misery. The first photograph by Isidore van Kinsbergen (1873) after the monument had been cleared up. Following the Anglo-Dutch Java War, Java came under British administration from 1811 to 1816. Lieutenant Governor-General Thomas Stamford Raffles, who had a great interest in the history of Java, had been appointed governor. He collected Javan antiques and made notes through contacts with local inhabitants during his tour throughout the island. On an inspection tour to Semarang in 1814, he received information about a big monument called Chandi Borobudur deep in a jungle near the village of Bumisegoro. Unable to make the discovery himself, he sent H.C. Cornellius, a Dutch engineer, to investigate. In two months, Cornellius and his 200 men cut down trees, burned down vegetation and dug away the earth to reveal the monument. Due to the danger of collapse, he refrained from unearthing all galleries. He reported his findings to Raffles including various drawings. Although mentioning the discovery with only a few sentences, Raffles has been credited with the monument's recovery and bringing it to the world's attention. Hartmann, a Dutch administrator of the Kedu region, continued Cornellius' work and in 1835 finally unearthed the whole monument. He had a more personal than official interest in Borobudur, never writing reports of his activities; in particular, the alleged story that he discovered the large statue of Buddha in the main stupa. The main stupa stood empty. In 1842, Hartmann investigated the main dome although what he discovered remains unknown. The Dutch East Indies government then commissioned a Dutch engineering official, F.C. Wilsen, who in 1853, reported a large Buddha statue the size of one hundred other Borobudur statues. Appreciation of the site developed slowly. Thieves and souvenir hunters routinely removed some reliefs and ornaments. Following the major 1973 renovation funded by UNESCO, Borobudur has become once again a place of worship and pilgrimage. Once a year, during the full moon in May or June, Buddhists in Indonesia observe Vesak (Indonesian: Waisak) day commemorating the birth, death, and the time when Bodhisattva attained the highest wisdom to become Buddha. Vesak constitutes an official national holiday in Indonesia, the ceremony centered at the three Buddhist temples by walking from Mendut to Pawon and ending at Borobudur. Tourists visit the monument daily, elevating the site to the single most visited tourist attractions in Indonesia. By the mid 1990s, 2.5 million visitors annually (80 percent domestic tourists) visited, up from 260,000 tourists in 1974. On January 21, 1985, nine bombs badly damaged nine stupas. In 1991, a blind Muslim evangelist, Husein Ali Al Habsyie, received life imprisonment for masterminding a series of bombings in the mid 1980s including the temple attack. Two members of a right-wing extremist group that carried out the bombings each received sentences, one up to 20 years in 1986 and another man received a 13-year prison term. On 27 May 2006, an earthquake of 6.2 magnitude on Richter scale struck the south coast of Central Java. The event had caused severe damage around the region and casualties to the nearby city of Yogyakarta, yet Borobudur remained intact. Borobudur, built as a single large stupa, takes the form of a giant tantric Buddhist mandala when viewed from above, simultaneously representing the Buddhist cosmology and the nature of mind. The foundation forms a square, approximately 118 meters (387 ft) on each side. Nine platforms, the lower six square and the upper three circular, grace the structure. The upper platform features seventy-two small stupas surrounding one large central stupa. Each stupa has a bell-shape, pierced by numerous decorative openings. Statues of the Buddha sit inside the pierced enclosures. Approximately 55,000 m³ (almost 2 million cubic feet) of stones came from neighboring rivers to build the monument. Workman cut the stone to size, transporting them to the site and laid without mortar. Knobs, indentations and dovetails formed joints between stones. Artists created reliefs in-situ after the building had been completed. The monument enjoys a good drainage system to cater for the area's high storm water run-off. To avoid inundation, 100 spouts embellish each corner with a unique carved gargoyles (makaras). Stairways climb up at the center of each side with a number of gates, watched by a total of 32 lion statues. A carved spout (makaras) for water drainage. Borobudur differs markedly with the general design of other structures built for that purpose. Instead of building on a flat surface, Borobudur sits on a natural hill. The building technique has similarities with other temples in Java. With no inner space as in other temples and its general design similar to the shape of pyramid, Borobudur at first had been mistaken as a stupa instead of a temple (or candi in Indonesian). A stupa serves as a shrine for the Lord Buddha. Sometimes craftsmen build stupas only as devotional symbols of Buddhism. A temple, on the other hand, serves as a house of deity and have inner spaces for worship. The complexity of the monument's meticulous design suggests a temple. The structure comprises six square platforms topped by three circular platforms, decorated with 2,672 relief panels and 504 Buddha statues. Seventy-two Buddha statues seated inside the perforated stupa surround a main dome, located at the center of the top platform. The monument serves both as a shrine to the Lord Buddha and a place for Buddhist pilgrimage. The journey for pilgrims begins at the base of the monument and follows a path circumambulating the monument while ascending to the top through the three levels of Buddhist cosmology, namely, Kamadhatu (the world of desire); Rupadhatu (the world of forms); and Arupadhatu (the world of formless). During the journey, the monument guides the pilgrims through a system of stairways and corridors with 1,460 narrative relief panels on the wall and the balustrades. 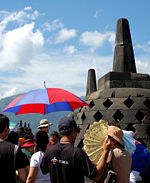 Pilgrimage constitutes the central congregational worship in Borobudur. The system of staircases and corridors ascending to the top platform guide pilgrims. Each platform represents one stage of enlightenment. The symbolism of sacred knowledge according to the Buddhism cosmology served as the model for the path that guides pilgrims. Half cross-section with 4:6:9 height ratio for foot, body and head, respectively. Scant records about the architect Gunadharma exist. Javanese legendary folk tales, rather than written in old inscriptions, serve as the only account of his name, referred to as the one who "… bears the measuring rod, knows division and thinks himself composed of parts." The architect had used the formula to lay out the precise dimensions of Borobudur. The nearby Buddhist temples of Pawon and Mendhut have identical formula. Archaeologists conjectured the purpose of the ratio formula and the tala dimension has calendrical, astronomical and cosmological themes, as of the case in other Buddhist temple of Angkor Wat in Cambodia. A narrow corridor with reliefs on the wall. The main vertical structure divides into three groups: base (or foot), body, and top, resembling the three major division of a human body. The base measures 123x123 m² square in size and 4 meters (13 ft) high of walls. Five square platforms each with diminishing heights compose the body. The first terrace sets back 7 meters (23 ft) from the edge of the base. The other terraces set back by 2 meters (6.5 ft), leaving a narrow corridor at each stage. The top consists of three circular platforms, with each stage supporting a row of perforated stupas, arranged in concentric circles. One main dome sits at the center, the top reaches the highest point of the monument (35 meters or 115 ft above ground level). Stairways at the center of each side with a number of gates, watched by a total of 32 lion statues, provide access to the upper part. The main entrance stands on the eastern side, the location of the first narrative reliefs. Stairways linking the monument to the low-lying plain rise on the slopes of the hill. The monument's three-fold division symbolizes the three stages of mental preparation towards the ultimate goal according to the Buddhism cosmology, namely Kamadhatu (the world of desires), Rupadhatu (the world of forms), and finally Arupadhatu (the formless world). 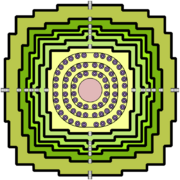 The base represents Kamadhatu, five square platforms (the body)Rupadhatu, and the three circular platforms and the large topmost stupa Arupadhatu. The architectural features between three stages have metaphorical differences. For instance, square and detailed decorations in the Rupadhatu disappear into plane less circular platforms in the Arupadhatu to represent how the world of forms—where men remain attached with forms and names—changes into the world of the formless. In 1885, restorers discovered a hidden structure under the base. The "hidden foot" contains reliefs, 160 providing narrative describing the real Kamadhatu. The remaining reliefs, panels with short inscriptions, describe instruction for the sculptors, illustrating the scene they would carve. An encasement base hides the real base that served an unknown function. The encasement base had been built with detailed and meticulous design with aesthetics and religious compensation. Borobudur contains approximately 2,670 individual bas reliefs (1,460 narrative and 1,212 decorative panels) covering the façades and balustrades. The total relief surface measures 2,500 m², the panels distributed at the hidden foot (Kamadhatu) and the five square platforms (Rupadhatu). The narrative panels, telling the story of Sudhana and Manohara, group into eleven series encircled the monument with the total length of 3,000 meters (1.86 miles). The hidden foot contains the first series with 160 narrative panels and the remaining ten series distribute throughout walls and balustrades in four galleries starting from the eastern entrance stairway to the left. Narrative panels on the wall read from right to left, while on the balustrade read from left to right. That conforms with pradaksina, the ritual of circumambulation performed by pilgrims who move in a clockwise direction while keeping the sanctuary to their right. The hidden foot depicts the story of the karma law. The walls of the first gallery have two superimposed series of reliefs; each consists of 120 panels. The upper part depicts the biography of Buddha, while the lower part of the wall and also balustrades in the first and the second galleries tell the story of Buddha's former lives. The remaining panels depict Sudhana's further wandering about his search; terminated by his attainment of the Perfect Wisdom. The 160 hidden panels form a discontinuous story, each panel providing one complete illustration of cause and effect. Depictions of blameworthy activities, from gossip to murder, with their corresponding punishments have been etched. Praiseworthy activities, including charity and pilgrimage to sanctuaries, and their subsequent rewards, appear. The pains of hell and the pleasure of heaven, as well as scenes of daily life, complete with the full panorama of samsara (the endless cycle of birth and death), have been illustrated. The story starts from the glorious descent of the Lord Buddha from the Tushita heaven, and ends with his first sermon in the Deer Park near Benares. The relief shows the birth of Buddha as Prince Siddharta, son of King Suddhodana and Queen Maya of Kapilavastu (in present-day Nepal). Twenty-seven panels showing various preparations, in heavens and on earth, to welcome the final incarnation of Bodhisattva precede the story. Before descending from Tushita heaven, Bodhisattva entrusted his crown to his successor, the future Buddha Maitreya. He descended on earth in the shape of white elephants with six tusks, penetrated to Queen Maya's right womb. Queen Maya had a dream of that event, which had been interpreted that his son would become either a sovereign or a Buddha. While Queen Maya felt the time to give the birth had arrived, she went to the Lumbini park outside the Kapilavastu city. She stood under a plaksa tree, holding one branch with her right hand and she gave birth to a son, Prince Siddharta. The story on the panels continues until the prince became Buddha. Jatakas constitute stories about the Buddha before his birth as Prince Siddharta. Avadanas bare similarity with jatakas except with a main figure other than Bodhisattva himself. Other legendary persons have been attributed with the saintly deeds. 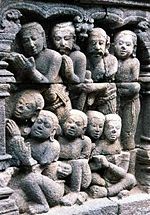 Jatakas and avadanas receive treatment in one and the same series in the reliefs of Borobudur. The first twenty lower panels in the first gallery on the wall depict the Sudhanakumaravadana or the saintly deeds of Prince Sudhanakumara. The first 135 upper panels in the same gallery on the balustrades have been devoted to the thirty four legends of the Jatakamala. The remaining 237 panels depict stories from other sources, as do for the lower series and panels in the second gallery. Some jatakas stories have been depicted twice, for example the story of King Sibhi. Gandavyuha, a story about Sudhana's tireless wandering in search of the Highest Perfect Wisdom, covers two galleries (third and fourth) and also half of the second gallery. They comprise in total 460 panels. The principal figure of the story, the youth Sudhana, son of an extremely rich merchant, appears on the 16th panel. The preceding 15 panels form a prologue to the story of the miracles during Buddha's samadhi in the Garden of Jeta at Sravasti. During his search, Sudhana visited no less than thirty teachers but none of them had satisfied him completely. Manjusri then instructed him to meet the monk Megasri, where he received the first doctrine. Sudhana journey continues to meet in the following order Supratisthita, the physician Megha (Spirit of Knowledge), the banker Muktaka, the monk Saradhvaja, the upasika Asa (Spirit of Supreme Enlightenment), Bhismottaranirghosa, the Brahmin Jayosmayatna, Princess Maitrayani, the monk Sudarsana, a boy called Indriyesvara, the upasika Prabhuta, the banker Ratnachuda, King Anala, the god Siva Mahadeva, Queen Maya, Bodhisattva Maitreya and then back to Manjusri. Each meeting has given Sudhana a specific doctrine, knowledge and wisdom. Those meetings appear in the third gallery. After the last meeting with Manjusri, Sudhana went to the residence of Bodhisattva Samantabhadra, depicted in the fourth gallery. The entire series of the fourth gallery has been devoted to the teaching of Samantabhadra. The narrative panels finally end with the Sudhana's achievement of the Supreme Knowledge and the Ultimate Truth. A Buddha statue with the hand position of dharmachakra mudra (turning the Wheels of the Law). Apart from the story of Buddhist cosmology carved in stones, Borobudur has many Buddha statues. The cross-legged Buddha statues, distributed on the five square platforms (the Rupadhatu level) and on the top platform (the Arupadhatu level), sit in lotus positions. The Buddha statues stand in niches at the Rupadhatu level, arranged in rows on the outer sides of the balustrades. As platforms progressively diminish to the upper level, the number of Buddha statues decreasing. The first balustrades have 104 niches, the second 104, the third 88, the fourth 72 and the fifth 64. In total, 432 Buddha statues appear at the Rupadhatu level. At the Arupadhatu level (or the three circular platforms), Buddha statues stand inside perforated stupas. The first circular platform has 32 stupas, the second 24 and the third 16, totaling 72 stupas. Of the total 504 Buddha statues, over 300 have been mutilated (mostly headless) and 43 have been stolen. ↑ UNESCO, Advisory Body Evaluation. Retrieved June 23, 2008. ↑ UNESCO, Borobudur Temple Compounds. Retrieved June 23, 2008. ↑ 4.0 4.1 Thomas Stamford Raffles, The History of Java (Oxford University Press, 1978, ISBN 0-19-580347-7). ↑ N. J. Krom, Borobudur, Archaelogical Description (The Hague: Nijhoff, 1978). ↑ 6.0 6.1 6.2 H. Murwanto, Y. Gunnell, S. Suharsono, S. Sutikno, and F. Lavigne, Borobudur monument (Java, Indonesia) stood by a natural lake: Chronostratigraphic evidence and historical implications, The Holocene 14 (3): 459–463. ↑ Paul Michel Munoz, Early Kingdoms of the Indonesian Archipelago and the Malay Peninsula (Didier Millet, 2007, ISBN 9814155675), 143. ↑ The Miami Herald, 1,100-Year-Old Buddhist Temple Wrecked By Bombs in Indonesia. Retrieved June 22, 2008. ↑ The Sydney Morning Herald, An ancient wonder reduced to rubble. Retrieved June 22, 2008. ↑ A. Wayman, Reflections on the Theory of Barabadur as a Mandala, Barabudu History and Significance of a Buddhist Monument (Berkley: Asian Humanities Press, 1981). ↑ 14.0 14.1 14.2 Soekmono (1976), 35-36. ↑ Peter Ferschin and Andreas Gramelhofer, Architecture as Information Space, 8th Int. Conf. on Information Visualization. ↑ 16.0 16.1 16.2 16.3 Caesar Voûte and Mark Long, Borobudur: Pyramid of the Cosmic Buddha (D.K. Printworld Ltd.). ↑ Gary Michael Tartakov, Lecture notes for Asian Art and Architecture: Art & Design 382/582 (Iowa State University). ↑ 20.0 20.1 20.2 20.3 Soekmono (1976), 20. ↑ 21.0 21.1 21.2 Soekmono (1976), 21. Atmadi, Parmono. 1988. Some Architectural Design Principles of Temples in Java: A Study Through the Buildings Projection on the Reliefs of Borobudur Temple. Yogyakarta: Gajah Mada University Press. ISBN 979-420-085-9. Dumarçay, Jacques. 1991. Borobudur. Trans. and ed. by Michael Smithies. Singapore: Oxford University Press. ISBN 0-19-588550-3. Gomez, Luis O. and Hiram W. Woodward. 1981. Barabudur, History and Significance of a Buddhist Monument, Presented at the Int. Conf. on Borobudur, Univ. of Michigan, May 16-17, 1974. Berkeley: Asian Humanities Press. ISBN 0-89581-151-0. Kempers, August J.B. 1976. Ageless Borobudur: Buddhist Mystery in Stone, Decay and Restoration, Mendut and Pawon, Folklife in Ancient Java. Wassenaar: Servire. ISBN 90-6077-553-8. Miksic, John. 1999. The Mysteries of Borobudur. Hongkong: Periplus. ISBN 962-593-198-8. Miksic, John. 1990. Borobudur: Golden Tales of the Buddhas. Boston: Shambala. ISBN 0-87773-906-4. Snodgrass, Adrian. 1985. The Symbolism of the Stupa, Southeast Asia Program. Ithaca, NY: Cornell University. ISBN 0-87727-700-1. Soekmono, R. , J.G. de Casparis, J. Dumarçay, P. Amranand, and P. Schoppert. 1990. Borobudur: A Prayer in Stone. Singapore: Archipelago Press. ISBN 2-87868-004-9. UNESCO, Chandi Borobudur—A Monument of Mankind. Retrieved June 22, 2008. Australia National University's research project on Borobudur. This page was last modified on 20 June 2016, at 18:13.